It’s hard to avoid the latest viral video that has spawned a ton of parodies and comical dance moves. A few weeks ago I was on a cruise ship and Gangnam was the hit of the karaoke club. The original song, “Gangnam Style” was written by South Korean singer and rapper PSY and is a lively, dare I say addictive, pop tune that encourages movement. Much like the “Macarana” or the “Cha Cha Slide” it is popular with children and adults even when they don’t understand a word being said (either because some words are not in English or because the lyrics are sung very quickly and are overpowered by the beat). Although it doesn’t include Korean words, Dear Juno by Soyung Pak explores communication between two people who don’t speak the same language. Juno can’t read a letter sent by his Korean grandmother but figures out what she is telling him through pictures included with the letter. Instead of asking his parents for help with Korean, he creates his own pictures to communicate with her. Bee-bim Bop! 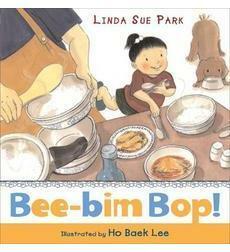 is a traditional Korean dish which translates as “mix-mix rice.” Linda Sue Park’s book has a bouncy rhyming text that is perfect for storytime to tell the story of a child watching, and helping, her mother shop for the ingredients, prepare the meal, and set the table. Since serving foo d at storytime can be difficult, let the children create their own take-home version of bee-bim bop with craft supplies like cut-up strips of felt in orange (carrots), green (spinach), white (onions), and brown (meat). Use white confetti or small packing peanuts for the rice. Place the pieces in a cup and let the children stir their dish with a plastic spoon. Include a recording of a song in Korean if possible. It can be a bit of a challenge to find Korean fingerplays and songs to use as breaks between books but there are some CDs available. 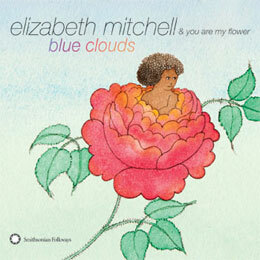 Try “San Toki (Mountain Bunny)” on Blue Clouds by Elizabeth Mitchell as this is a traditional song known by most Korean children. Finally put on a recording of “Gangnam Style” and let everyone dance their way out of storytime! This is a great idea, especially with the popularity of Gangnam Style. Gangnam Style is such a catchy song and everyone is listening to it, it seems. Children are smart and can usually pick up on what things mean if they are given pictures or context clues. I believe it’s a great practice to introduce children to books that are in different languages so that they see there are different cultures in this world and learn different word/phrases in other languages. Thanks for sharing! I agree that the kids will pick up on a few words and enjoy playing with language. I also like that some of the books show how language is somewhat fluid and we adopt words from other languages and cultures. Gangnam Style is so pervasive right now that it is hard to miss it. Someone in a neighboring town just put up Christmas lights that blink to the song! And I was a little concerned that young kids wouldn’t be able to do the movements, being totally uncoordinated myself, but I watched them dance on the cruise ship and the younger they are the more fun and the quicker they pick it up. Fun idea! I was at a hockey game this past weekend when they played song over the PA system during a break in the action. It was like a switch was flipped – almost all the kids in the crowd jumped up and started dancing after hearing just the first couple notes of the song!